A24 has been teasing us to death (heh) with their secret Chance the Rapper slasher since news of the mystery project first broke in 2016. Then they gave us a little taste with a teaser trailer last year, but that was the equivalent of tossing us a few pepperoni – we want the whole dang pie already! And now, it has arrived. 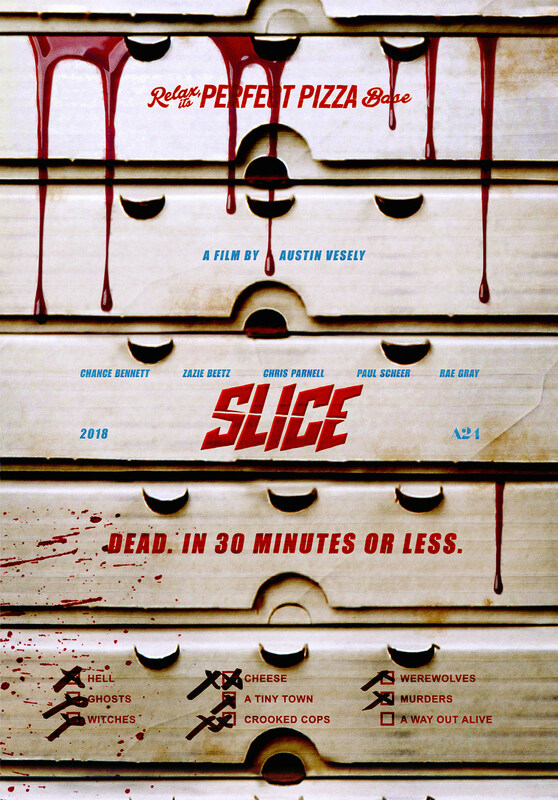 Chance the Rapper – who’s going by his real name Chance Bennett – makes his acting debut in Slice, a wild slasher about a small town murder spree where pizza delivery boys are the target. There’s talk of ghosts, werewolves (it looks like Chance plays one), lots of blood, evil demonic people, and scooters, lots of scooters. Slice comes from first-time feature director Austin Vesley, who’s worked with Chance on a pair of music videos. If you weren’t already hyped with that first tease, this trailer will definitely have you anxious to get this thing in your eyeballs ASAP. Slice also stars Deadpool 2‘s Zazie Beetz, Steve from Stranger Things (aka Joe Keery), Paul Scheer, Y’lan Noel of Insecure, Hannibal Buress, and Chris Parnell. Check out the poster below, and be sure to check that your next pizza delivery person gets home safe.